Mbwa Fahali ME is the "millennium edition" of Mbwa Fahali. To produce this excellent buck we bred Mbwa Fahali to an Hakuna Matata daughter. He was born on April 8, 2000 which made him too young to send to the ASU performance test, but his 1/2 brothers did outstanding on test. Like our other sires, he was selected because of his excellent conformation. He stands square on his front and rear legs, is long, and has a perfect bite. From the rear his hind legs form an upside down "U" shape, instead of an inverted "V" (you can't see that in the photo below because of the way he has his hind legs positioned), indicating that the inside of the leg will contain an exceptional amount of meat. The underside of his tail is jet black, and his horns are set wide apart. Mbwa Fahali Me has an impressive pedigree that includes Natural Bridge Boer Goats' Tsjaka and J20, as well as, Downen Livestock's Little 85 in addition to our sires listed above. does that we acquired from CPS Boer Goats. These does were sired by DOW K338 (a.k.a. 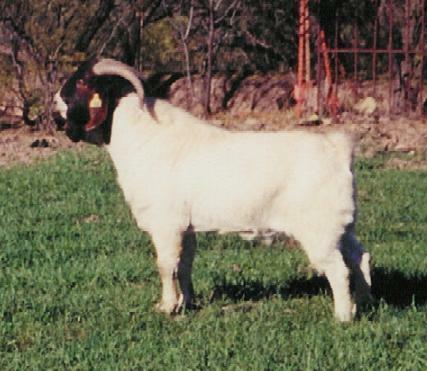 Jasper), winner of the Fullblood Aged Bucks class at the 2001 San Antonio Livestock Show. The overall quality of those kids is impressive. Unfortunately, most of our other sires are closely related to him, so we have little use for his daughters. As a result we sold most of them, since they don't give us much breeding flexibility. 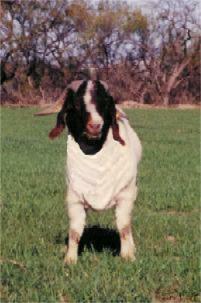 Ultimately we sold Mbwa Fahali ME as a commercial herd sire to a ranch in Arizona on September 25, 2003.